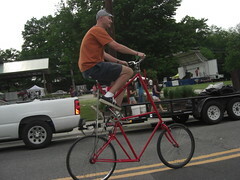 Thanks to the groovy folks at the Durham Bike Co-op, I got to ride a tall bike for the first time this weekend whilst downtown at Durham's Earth Day festival. As a tall guy, I was looking forward to giving it a shot. But, as you can see from the pic, even though the bike is tall, its actually sized for someone a lot shorter than me. Its amusing being on a tall bike that's actually too short for you.